The health coach is a key player on the team of professionals encouraging those in need of behavior change to take charge of their health. Structuring health coaching programs, whether in person, online or telephonic, to improve health status can provide big payoffs in those in need of health coaching. 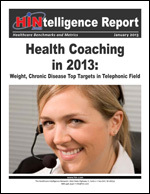 The HealthCoach Huddle provides a source of health coaching news, developments and case studies. When health coaches employ motivational interviewing during patient encounters, expect upticks in medication adherence, weight loss, HbA1c levels and overall engagement, notes Alicia Vail, RN health coach for Ochsner Health System. Ochsner’s eight health coaches focus on patients with diabetes, hypertension and obesity who have come to their attention by way of physician referrals, health screenings and pre-chart reviews. In this podcast, Ms. Vail describes how Ochsner Health System incorporates health coaches in its clinic structure and describes the benefits that result from the coaching intervention. William Appelgate: Health Coaching’s Value in Accountable Care and Medical Homes. Click here to listen. John Riedel: Health and Wellness Incentives: Positioning for Outcome-Based Rewards. Click here to listen. Dr. Dennis Richling and Kelly Merriman: Integrated Health Coaching: The Next Generation in Health Behavior Change Management. Click here to listen. Melanie Matthews: Healthcare Performance Benchmarks: Diabetes Management. Click here to listen. Dr. Janice Pringle: CMS Innovation Panel Looks to Medication Adherence as Potential Delivery Innovation. Click here to listen. Melinda Huffman: Health Coaching Trends for 2012. Click here to listen. Dr. Jim Reynolds: Health Coaching Evaluation  Measuring the ROI on Healthcare Utilization and Costs. Click here to listen. Kate Larsen: Finding Success in Health Behavior Change. Click here to listen. Paul Terry: Calculating the Health Coaching ROI: Models and Results. Click here to listen. Dr. Ruth Wolever: Using motivational interviewing for behavior change. Click here to listen. Sean Slovenski: Key questions to ask during the coaching vetting process. Click here to listen. Jennifer Hidding: New developments — coaching without a coach, holistic coaching, online personal health coaching and President Bush's mandate for mental healthcare parity. Click here to listen. Roger Reed: How online personal health coaching methods will affect traditional coaching methods. Click here to listen. Dr. Richard Bedrosian: Binge eating disorder and its impact on healthcare costs in the United States. Click here to listen. Question: What Type of Clinical Training Do You Provide Your Advanced Practice Coaches? This week's expert is Kelly Merriman, Vice President of Service Delivery for HealthFitness. Response: (Kelly Merriman) The training for a health coach is centered on evidence-based behavior change approaches and how to improve health with lifestyle approaches. Our nurse coaches take a behavioral approach, too; they have this training along with the clinical guidelines and best practices associated with managing chronic illness, including techniques to improve medication adherence. The advanced practice coach training combines the best of both worlds; the clinical guidelines so they can monitor a participant’s condition with confidence, and also the behavior change strategies that help a participant achieve and maintain their optimal health. For more information on health coaching, please visit: Guide to Health Coaching . View the current and archive issues. 2013 Healthcare Benchmarks: Health Coaching presents actionable new data on overall health coaching activity, with the latest metrics on the prevalence of health coaching, program components, delivery methods, preferred behavior change models, coaching case loads, ROI, and much more. Integrated Health Coaching: Reducing Risk and Empowering Change across the Health Continuum describes how HealthFitness aligns individuals with the right coaching service at the right time, leveraging individuals' intrinsic motivation to address underlying lifestyle issues that may impede health status and drive up healthcare spend. 2012 Healthcare Benchmarks: Health & Wellness Incentives provides actionable information from 136 healthcare organizations on the use of incentives to promote health behavior change. Guide to Health Coaching lays the groundwork for a health coaching initiative, delivering the following: A comprehensive set of 2013 health coaching benchmarks from 150 companies; an examination of integrated coaching's toolbox of interventions that span the health risk continuum; and much more.